reversing lever notch spacing - Page 2 - The Home Machinist! Just to make things more interesting, no matter what type of valve gear you are using, if you get the gear set up perfectly, the locomotive will run in mid-gear on level track if you are over about 5 miles an hour (for 7 1/4"). The locomotive will have no power to speak of, but it will run in either direction. It does this because the valves open briefly at top and bottom dead center because of lap and lead. 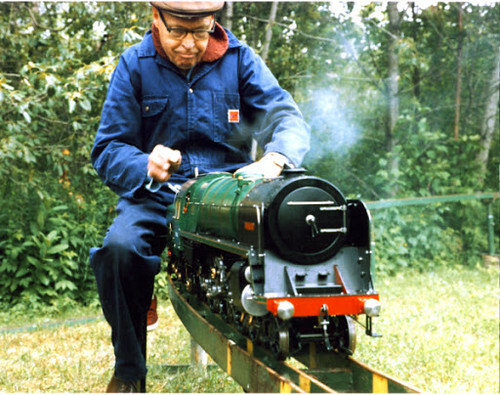 I know because I've driven a 7 1/4" gauge 4-4-0 (Harry Allin's Centennial) that does this. Just my 5 cents (2 cents isn't worth anything these days). ChuckHackett-844 wrote: Take care to have physical stops (not just the notches) at the limits so as not to damage the valve gear with overtravel as has been mentioned. If I pull the rod all the way back, some elements of the valve train will bump into each other, so I will be taking that into account. Steve, what locomotive are you building? Is it piston valve or slide valve? I bought one that is "some assembly required". I've attached some pics of the chassis. Not a Trainman or JBodenmann build, even after a case of beer, but if I can get it running, it will be a lot of fun. It's a 3 dressed up as a 9 ? (classic Canadian song- https://www.youtube.com/watch?v=nBrCcYr0y5M ), and don't worry, I love them rough and running...beats pants off too good to ever see a fire. I also love seeing a locomotive come back in after a day of running and there is oil, soot, and dirt all over it... and a smile on the owner's face. 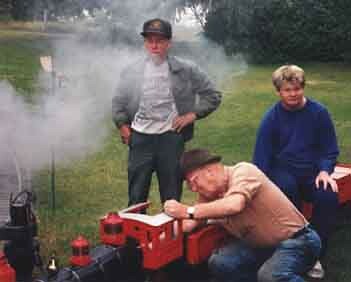 I enjoy seeing people treat a steam locomotive the way most railroads did their own, and run the crap out of them. There's plenty of room in this hobby for the exact-replica prototype guys, but also plenty of room for those who wish to just go out and run the wheels off of it and enjoying playing trains. I enjoy seeing both, as long as it runs and is safe. Back on topic... I don't see much use in putting a whole bunch of notches in your reverse quadrant unless you just want to. At some longer more level tracks maybe, but at Mid-South, the grades and curves change rapidly enough that the best thing to do is just put it in full forward and leave it alone. You'll have plenty of other stuff to do to keep you busy while working your load up at 3% grade! I always notch mine so that it gives me the travel that I need in my valve gear in forward, and again in reverse, and then I set the middle notch so that it holds the valve gear in the neutral position, wherever that is. I assemble everything, then mark my locations with a sharpie, and then go back and machine out the notches.